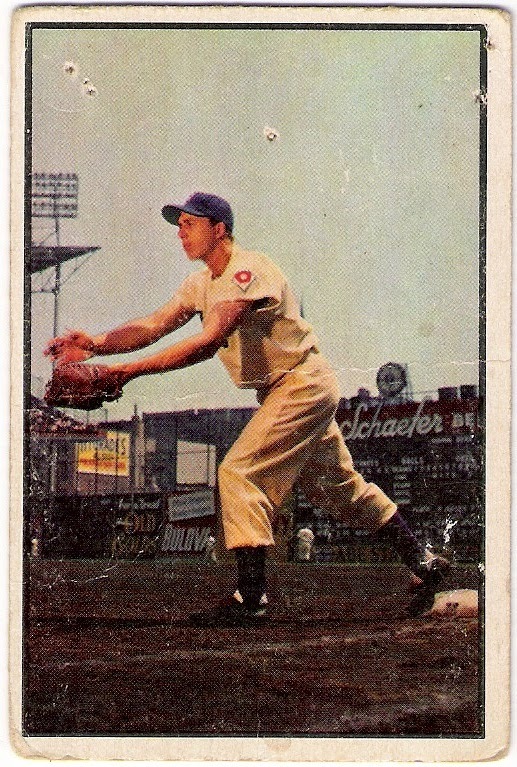 i sort of stumbled into a small cache of 1950's cards recently. 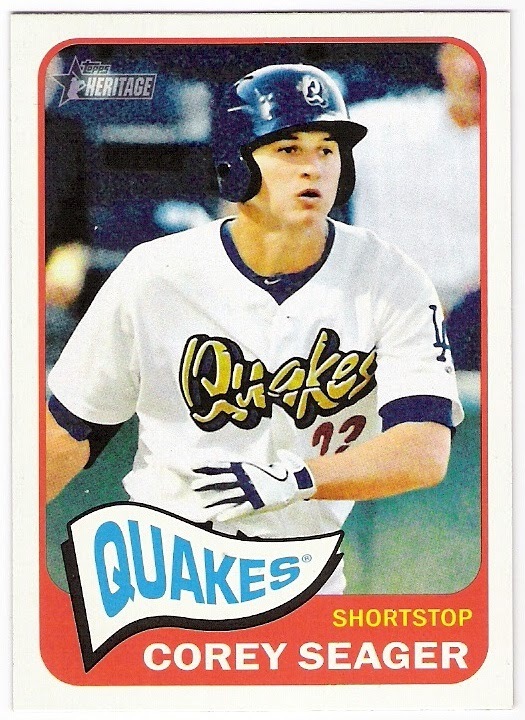 there was one card in particular that i was after, and it was included in a lot with about a dozen others. i was somewhat surprised when this beauty fell out of the package. 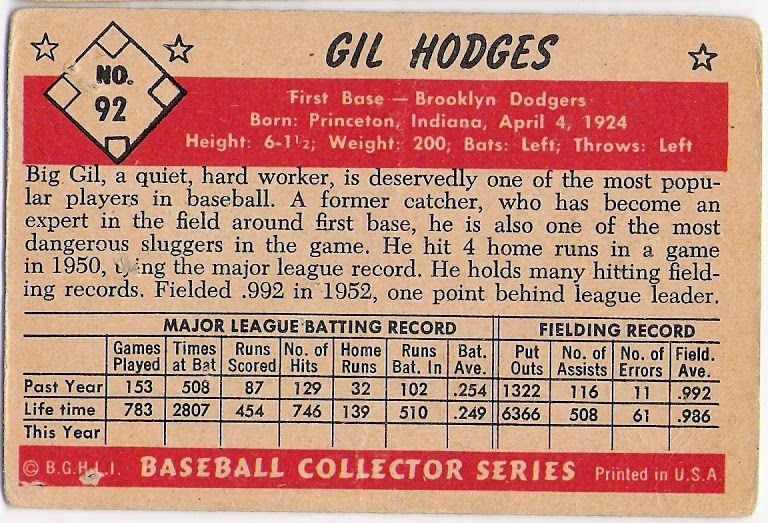 that would be a 1953 bowman color gil hodges card, and it is pretty as heck, even with the pinholes. 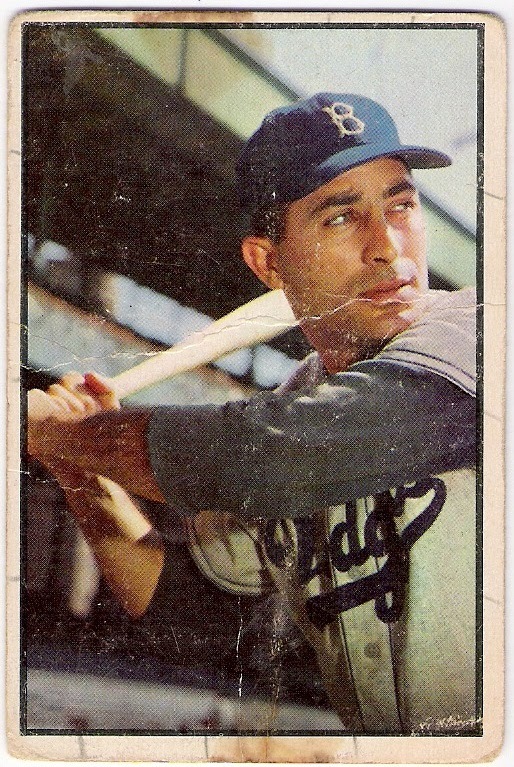 it' features the type of photo that might have been used in the 1957 topps set - full of color with the old ballpark on full display. ebbets field shines in the background with the outfield advertising, especially the schaefer beer sign. i understand that the sign would light up its 'h' if a player reached base on a hit, and it would light up one of its 'e's if the player reached by error. that's a great way to get several thousand people to fixate on your sign. 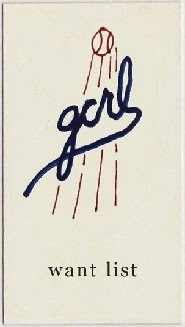 here's the back of the card which is really bright. so happy to have this card. 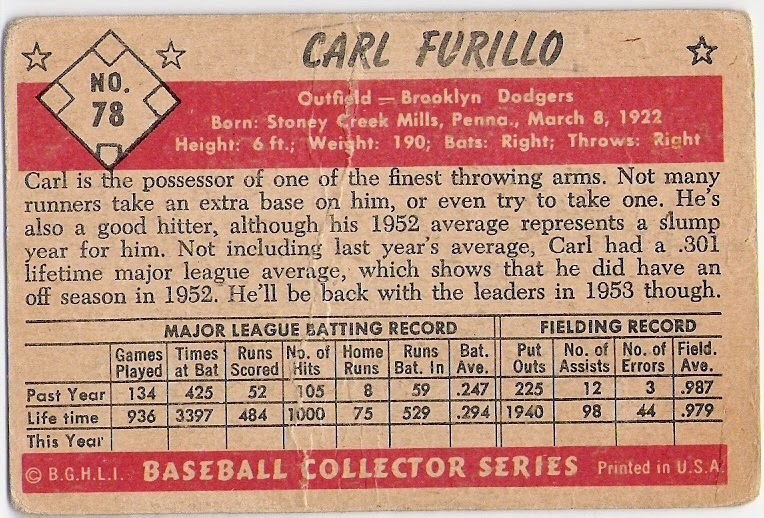 the person who wrote the text was spot on - furillo bounced back in 1953 in a huge way. he led the league with a .344 batting average, was 3rd in doubles, and 5th in slugging percentage and ops. ken mcmullen, a dodger double dipper and third baseman, lost his 30-year old wife bobbie to breast cancer in april of 1974, just five months after she had given birth to their third child. he laid his wife to rest on april 8 while most of his teammates (i believe don sutton attended the funeral) were in atlanta to take on the braves. 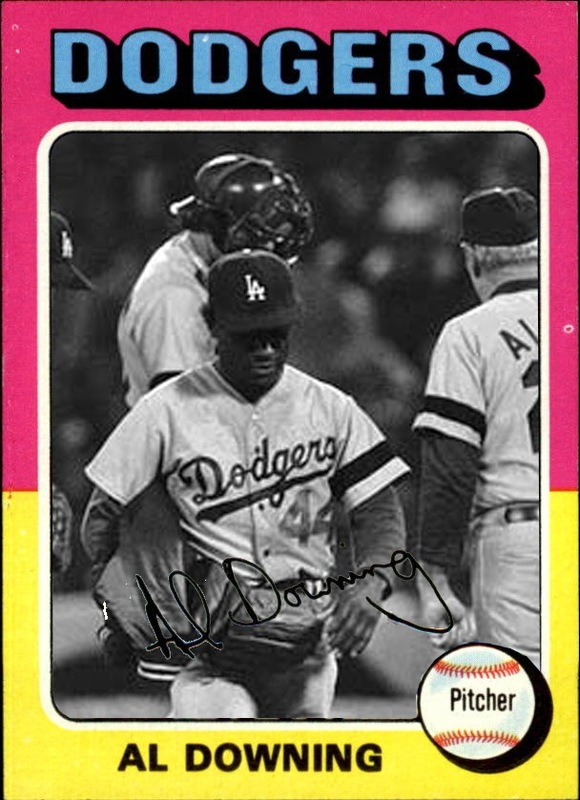 that night, the dodgers wore a black armband on their left sleeves in honor of mcmullen's wife. 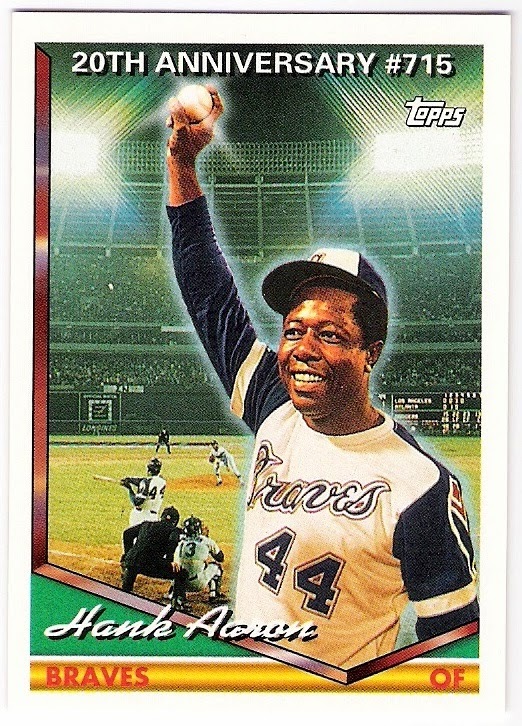 that also happened to be the night that hank aaron hit career home run number 715 to break babe ruth's career home run record. 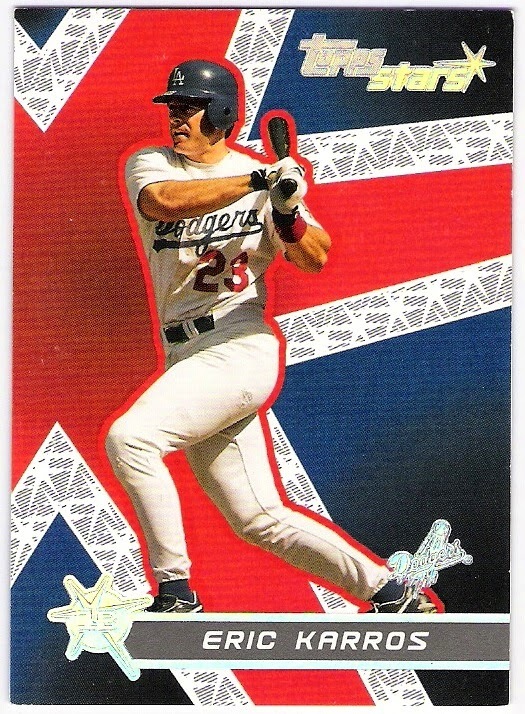 here's the 1994 topps card that celebrates the 20th anniversary of hammerin' hank's historic home run. 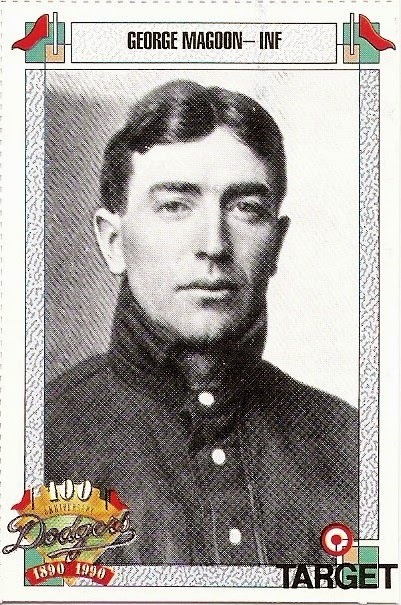 this card represents the mcmullen memorial in my collection because the black armband is visible on al downing's left arm in the background photo. joe ferguson, the catcher, is wearing the armband, too, but it is obscured by the home plate umpire, satch davidson. 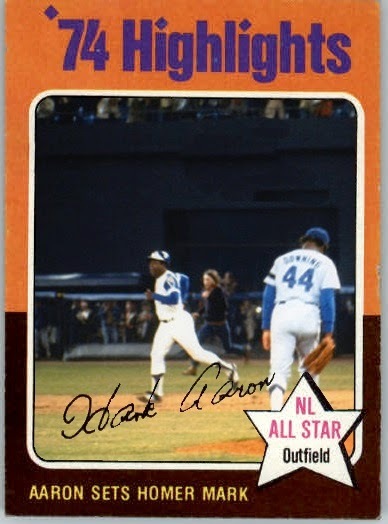 it's too bad that topps didn't find a way to incorporate photos from the game into the 1975 set. while i appreciate the 1994 card, i decided to try my hand at making some cards that should have been. 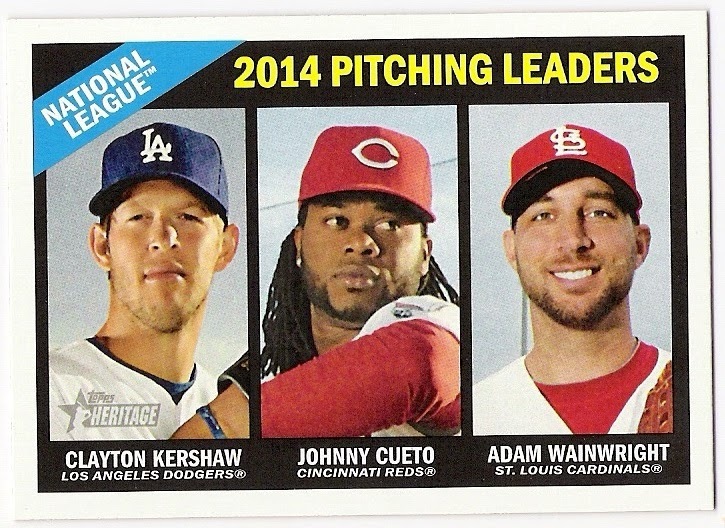 here's the card that topps did include in the set - at number 1, in fact. now we see the armband on downing again, along with one of the guys who chased aaron around the bases. 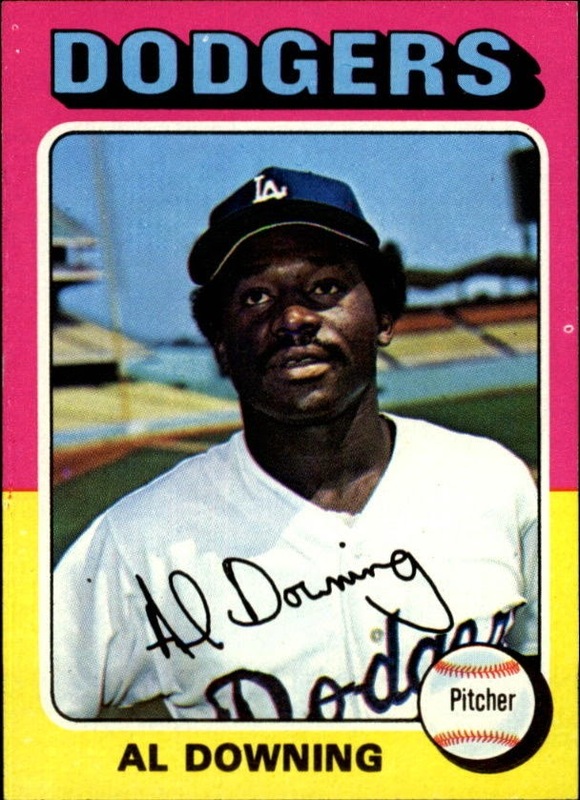 speaking of downing, even though he allowed the home run (which tied the game), there's no shame in being linked to that kind of history. so, why not use a photo from that night on his card in the set? and look - there's steve garvey lurking in the background! 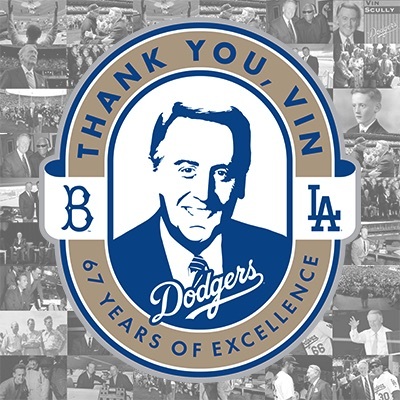 even though it does feature dodger stadium in the background. here's the full mound scene, with marshall and garvey, and davidson, i believe. mcmullen returned to the dodgers and resumed his pinch-hitter role later that week, which must have been difficult even though it seems to be what she would have wanted based on this article from the associated press. as for the dodgers, they have not worn black armbands since this particular memorial. fortunately, lots of evidence of the memorial worn for ken mcmullen's wife exists, just not much on cardboard. there have been eight men who, while playing for the dodgers, have been named the most valuable player of the world series. 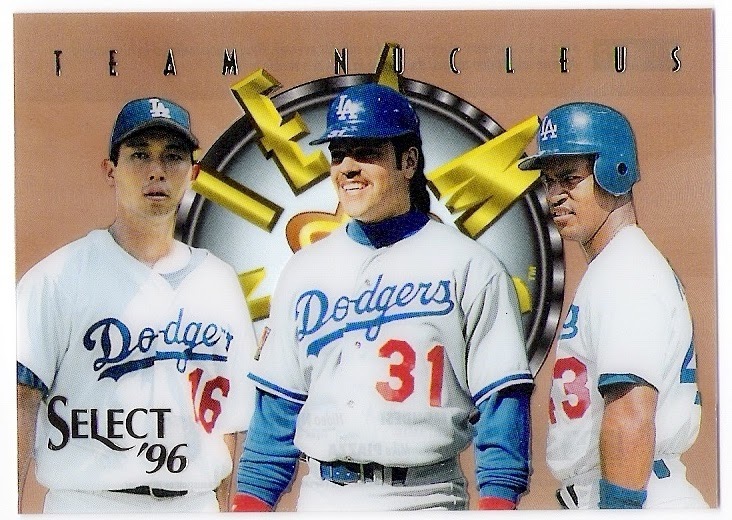 this sheet of 15 cards from the 1990 target dodger anniversary set has two of them, plus 13 others to have worn the uniform of the franchise between 1890 and 1990. have a look. carey was (and still is) one of the greatest defensive outfielders in the history of the game. 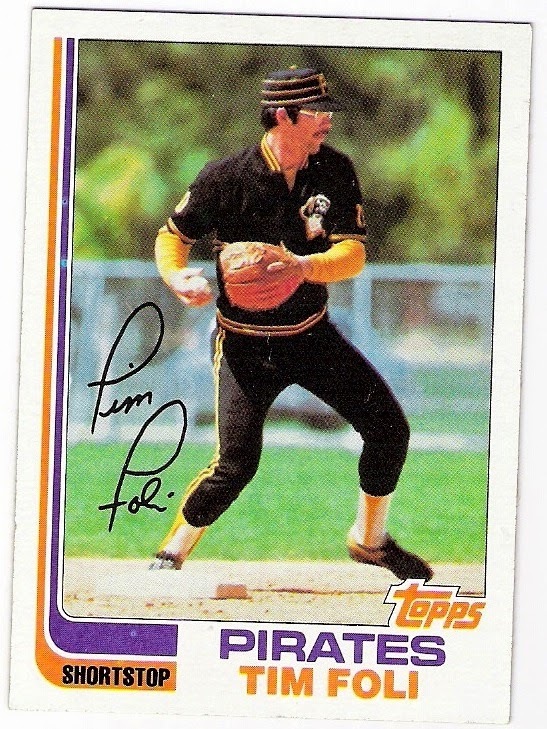 he was also one of the best base stealers, too, and his 10 stolen base championships while with the pirates helped cement his hall of fame status. he joined the robins during the 1926 season when he was 36 years old, but he continued to play for brooklyn through the 1929 season. in 1932, he returned to the franchise as their manager, replacing wilbert robinson as the team became the dodgers once again. 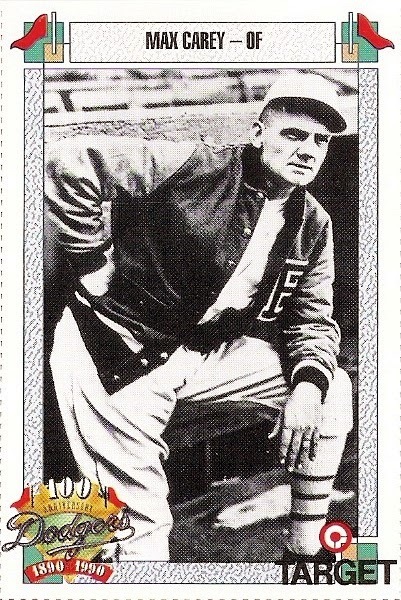 although he led the team to a 6th place finish in 1933 (his last season as the manager) he was still added to the national league's coaching staff for the first all-star game. 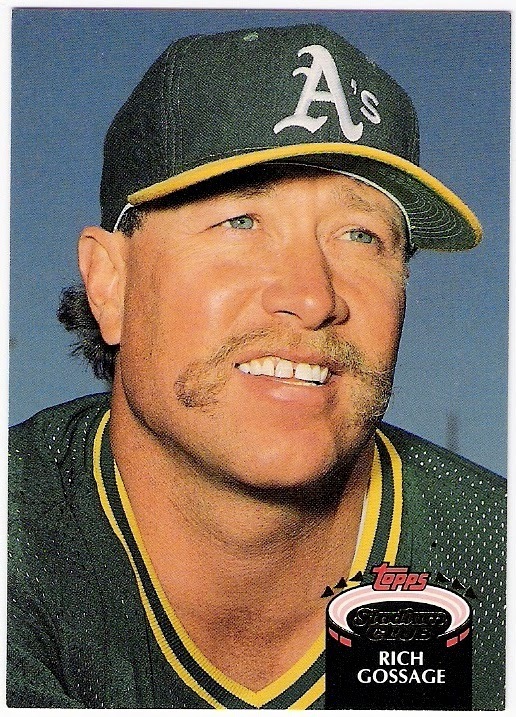 according to baseball reference, they called him 'mr. chips'. 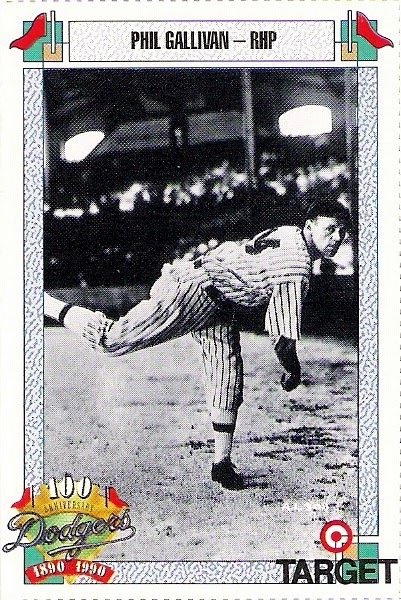 chipman was a brooklyn native who debuted for the hometown dodgers in 1941. he pitched in one game that season, two the next, and one in 1943. in 1944, chipman pitched in 11 games for the dodgers before being traded to the cubs in june for eddie stanky. 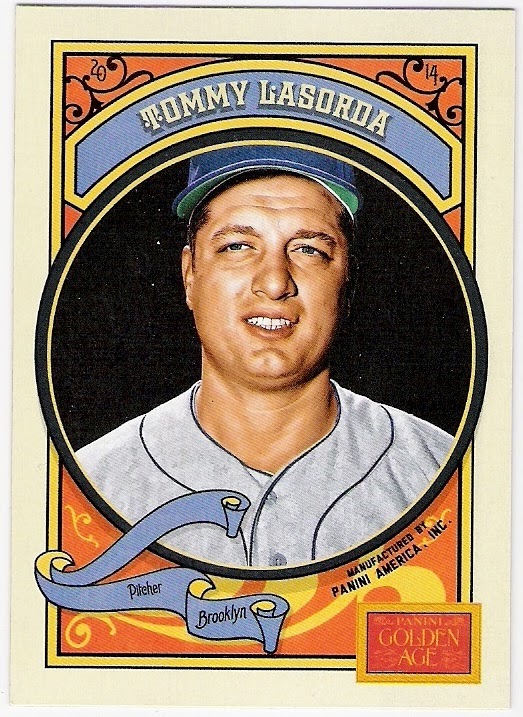 he wound up pitching for chicago through 1949, and then spent 3 years with the boston braves. 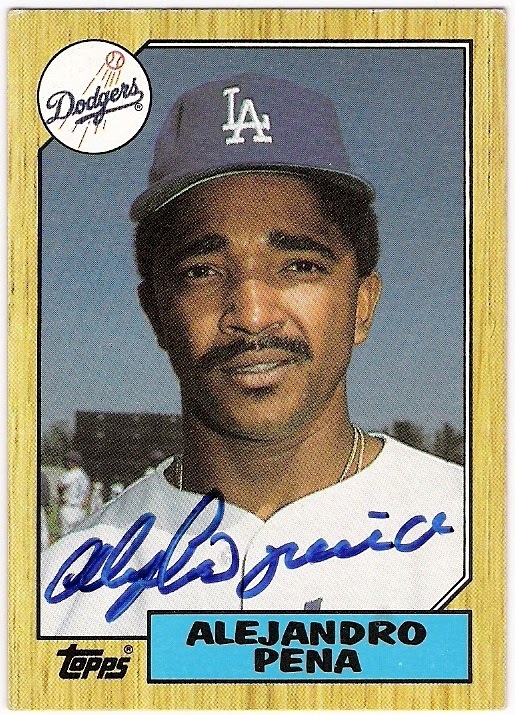 davis is, quite simply, one of the greatest los angeles dodgers ever. 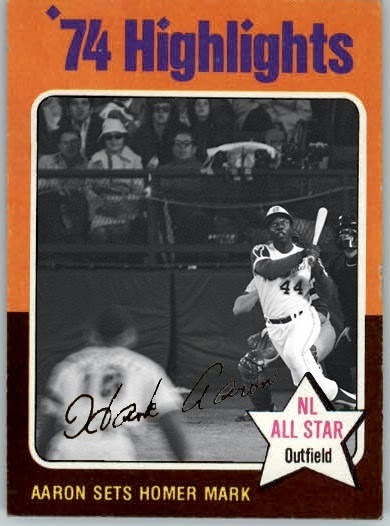 after hitting .318 in 22 games as a rookie in 1960, davis spent the next thirteen seasons as the team's primary center fielder. 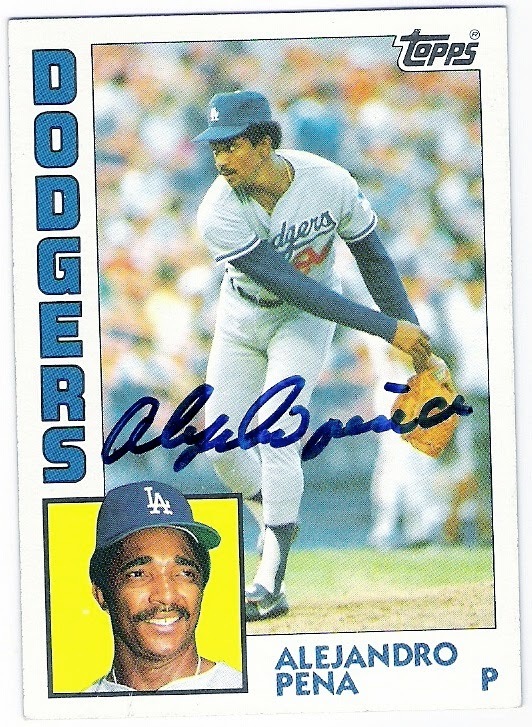 as a result, his name sits near or atop the dodger (and especially los angeles dodger) career leader board in many categories. no other los angeles dodger has had more plate appearances, scored more runs, had more base hits, or boasts a greater war than 3-dog. 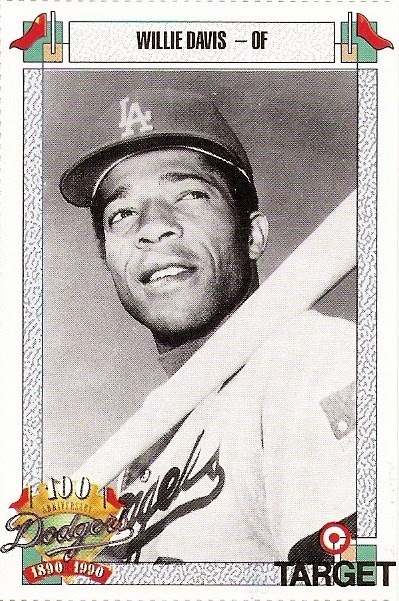 i was disappointed that the team did not wear a memorial patch following davis's death in 2010.
dean got his start in the big leagues as a dodger in 1967. he hit .143 in 12 games as a september call-up that year, but was back in the minors for the 1968 season. 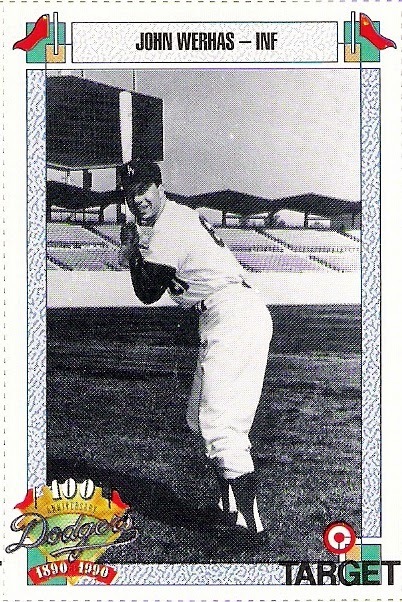 dean was traded to the padres early in the 1969 season for al mcbean, and became their regular shortstop in their inaugural season. 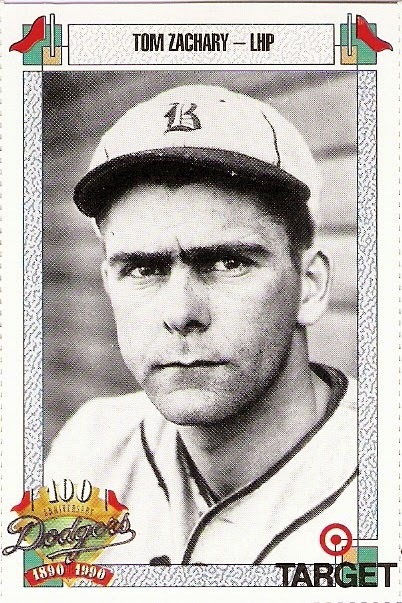 gallivan was a pitcher on the 1931 robins. 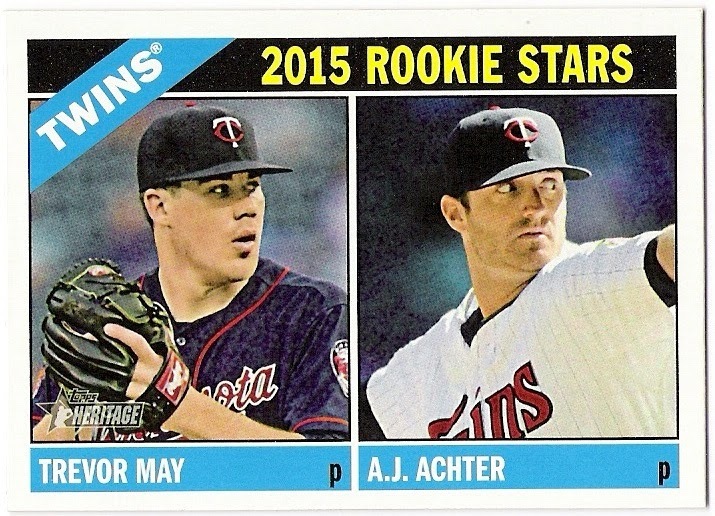 it was his first year in the majors, and he posted an 0-1 record in 6 appearances. the next season, he was pitching for the white sox who later traded him for a player named george washington. 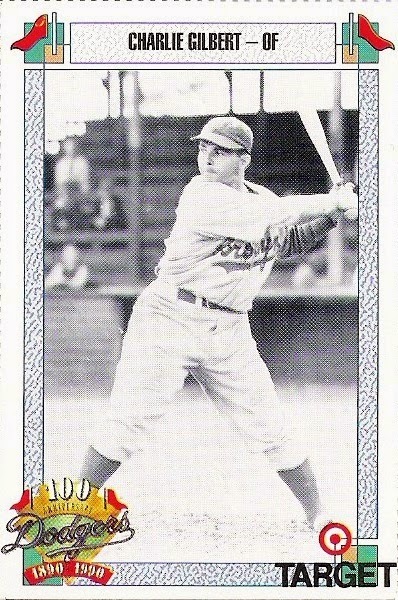 gilbert hit .246 as a rookie for the 1940 brooklyn dodgers. 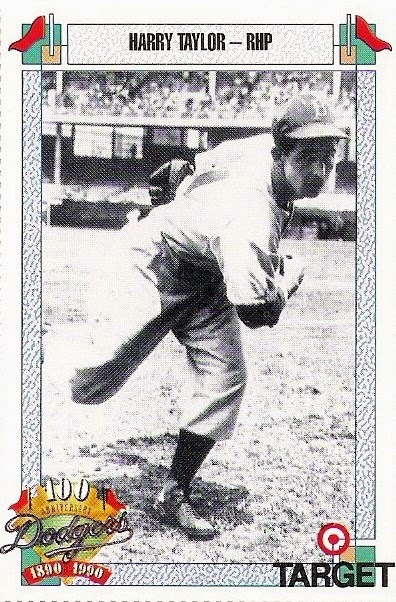 he was traded to the cubs in may of 1941 for billy herman. ah. 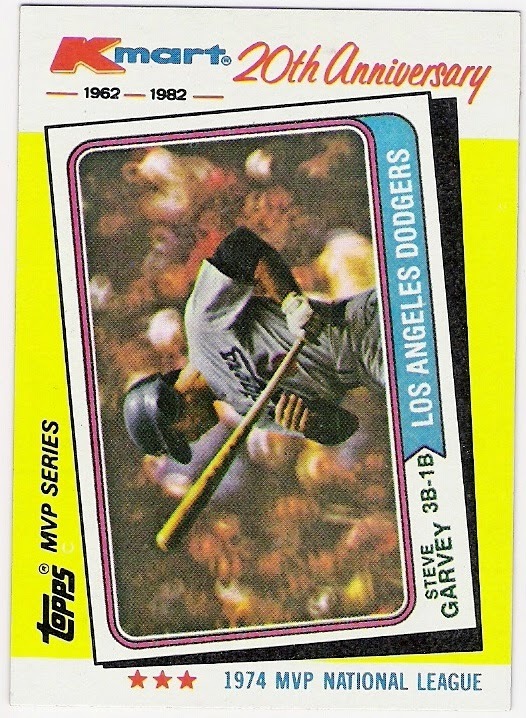 here's one of the world series mvp's that i mentioned up top. 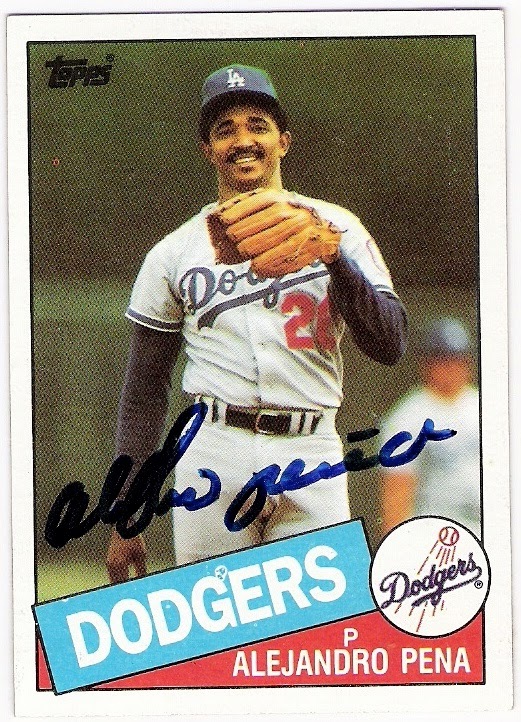 guerrero, of course, shared his award with ron cey and steve yeager in 1981. he hit .333 with 2 homers, 7 rbi, and an ops of 1.179 in that fall classic against the yankees and all was right with the world. 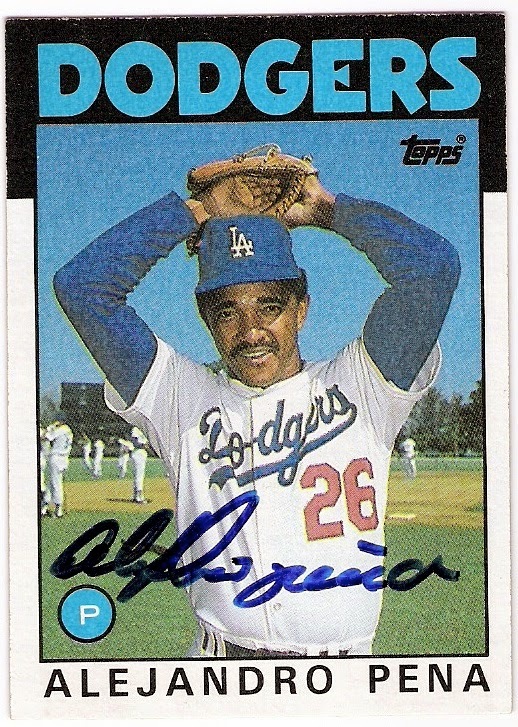 the next year, he finished third in the league mvp voting, and in 1983, the dodgers moved him to third base and he was fourth in the mvp voting. 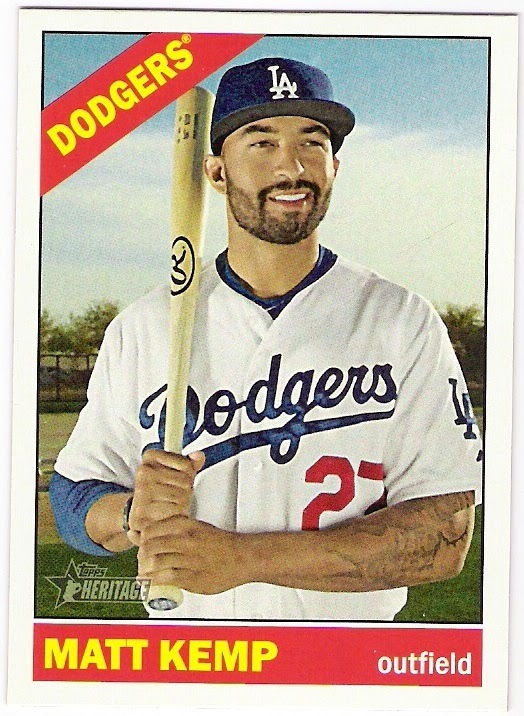 i've often wondered what might have happened if the dodgers had just left petey in the outfield and not tried to use him as a third baseman, but at the time it didn't seem to affect his offense too much. he was one of the most exciting players in the league, and i was glad he was on 'my' team. 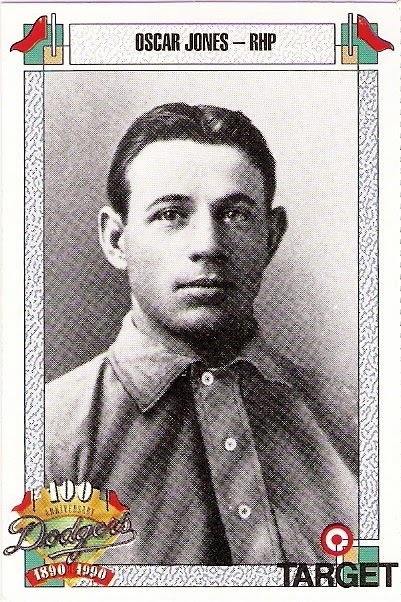 jones pitched for the brooklyn superbas from 1903 through 1905. after winning 19 games in 1903, jones led the league with 25 losses (paired with 17 wins) in 1902, a season in which he threw 377 innings and posted a 2.75 era. magoon was a brooklyn bridegroom in 1898 when he hit .224 in 93 games. 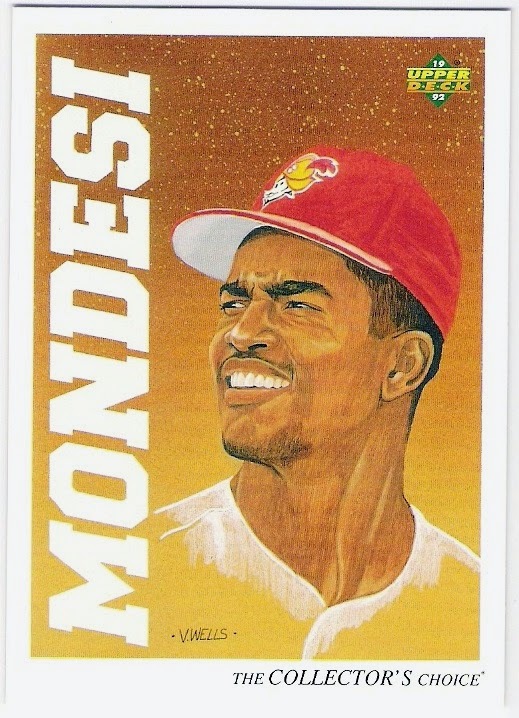 the next year, he was with the baltimore orioles and later played for the cubs, reds, and white sox. target put an extra 'i' in camilo's name, which is too bad since they are a company based in the twin cities which is where pascual had his best years. 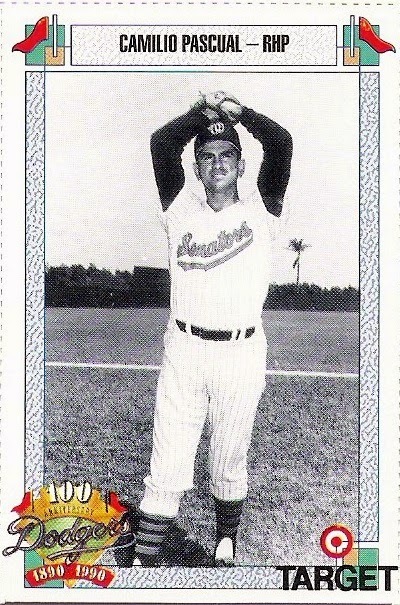 he was a member of the washington senators (as evidenced by the photo on the card) who moved to minneapolis with the rest of calvin griffith's squad in 1961. he won 20 games twice for the twins, and then pitched against the dodgers in the 1965 world series, losing game 3. the dodgers signed pascual as a free agent during the 1970 season, and while he didn't earn a decision as a member of the club, he pitched well in his 10 appearances as evidenced by his 2.57 era. 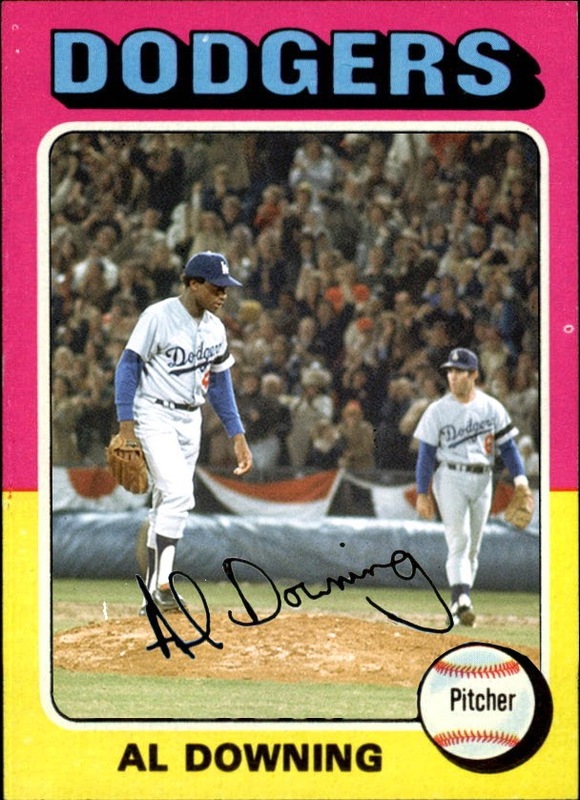 it's too bad that he wasn't held until the latter series of the 1970 set, as this is the only card of him as a dodger that i know of. podres was the first dodger to win the world series mvp award. 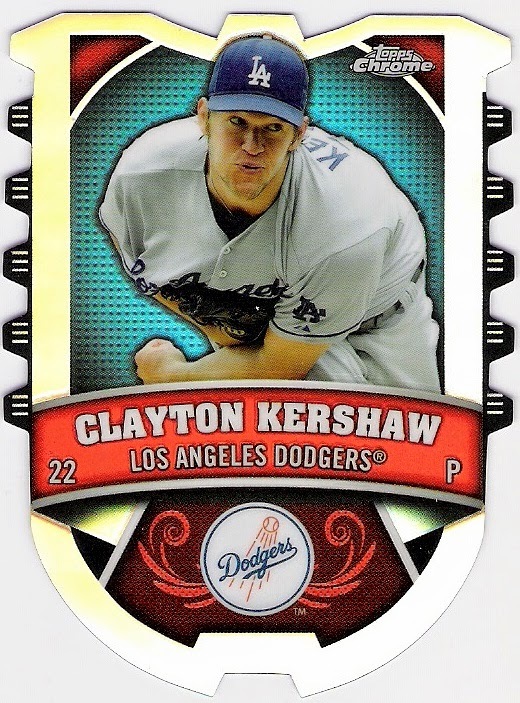 he won game 3 against the yankees with a complete game performance, and then shut out the bronx bombers at yankee stadium in game 7 to win the dodgers' first world championship. podres then spent the next season in the military. he returned to the club in 1957 and led the league in era and whip. 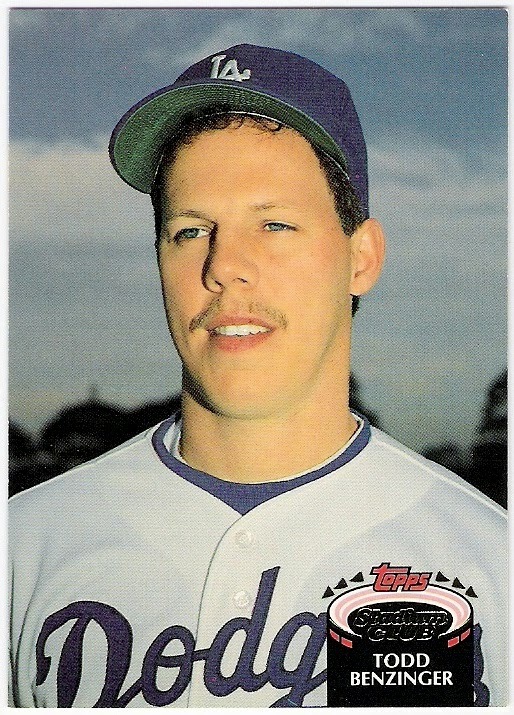 podres wound up winning a total of 136 games for the dodgers before pitching for the tigers and, fittingly enough, the padres towards the end of his career. 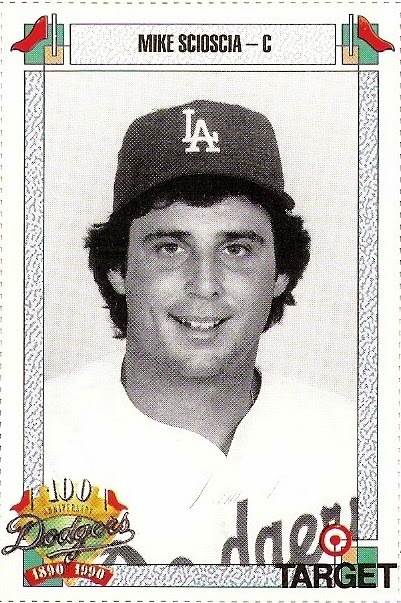 scioscia was the dodgers' first round pick in 1976, and he made his big league debut four years later. 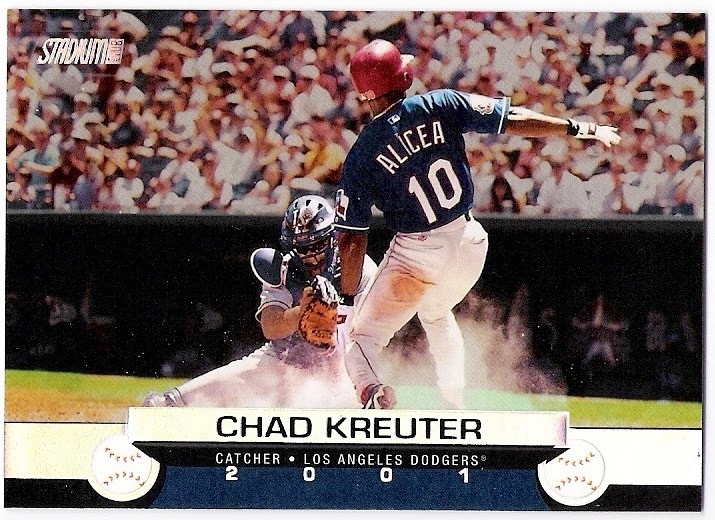 after that, he was essentially the dodgers' primary catcher through the 1992 season, and appeared to be a front runner to eventually become the team's manager, especially after bill russell was fired in 1998. no dice, however, as the club went with davey johnson for the 1999 season, and scioscia was soon leading the anaheim angels to a world series title. 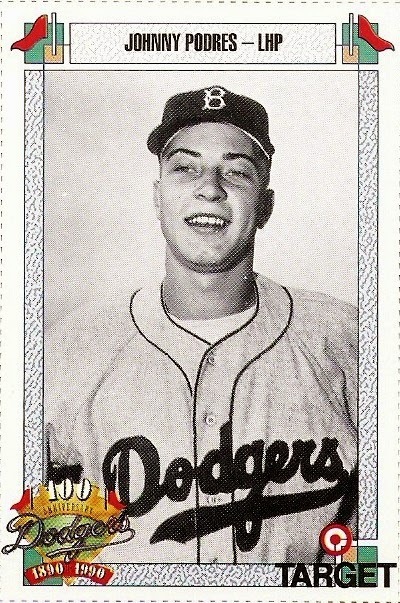 taylor pitched for the dodgers from 1946-48, getting most of his action in 1947 when he pitched in 33 games, 20 of which were starts, and had 10 complete games and 2 shutouts. he also pitched in the world series that year. 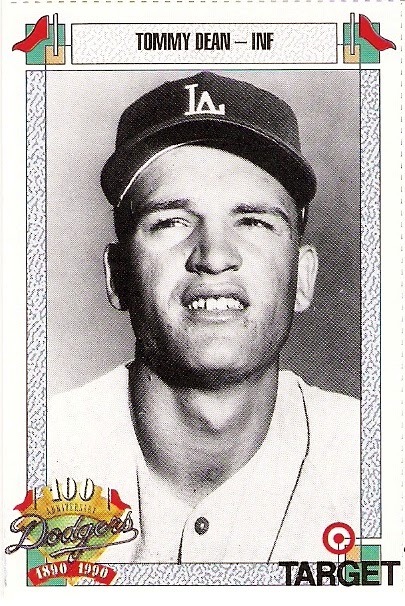 after spending 1949 and most of 1950 in the minors, his contract was purchased by the red sox, and he pitched for them through 1952.
werhas played for the dodgers during the mid to late 1960's. 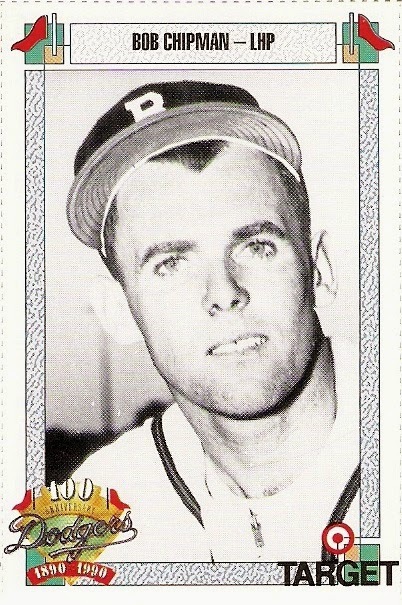 he debuted in 1964 and then had a short stint with the club again as a september call-up in 1965. he was called up once more in 1967 for a few games, and was then dealt to the angels for len gabrielson, who was werhas's teammate at usc. 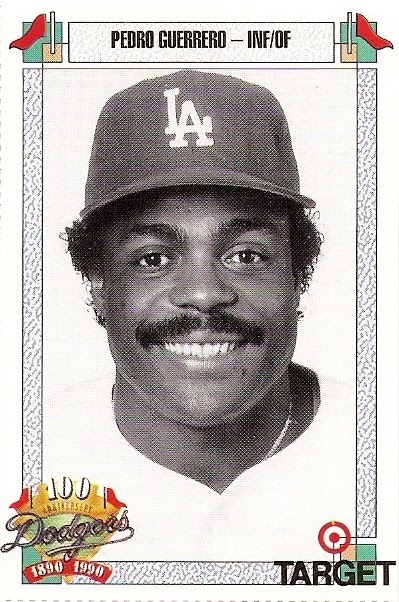 overall, werhas hit .183 in 40 games as a dodger. i knew who tom zachary was at a fairly young age, thanks to the fact that it was he who surrendered babe ruth's 60th home run in 1927. i did not know, however, that zachary became ruth's teammate the following year (and helped the yankees win the 1928 world series) nor did in know that he also went on to pitch for the dodgers in 1934. he was 5-6 with a 4.43 era, but pitched a bit better in 1935. in 1936, he made just one appearance as a dodger (allowing 2 runs in a third of an inning) before he was released - two years before the bambino joined the team as a coach. this post consists of six cards that i received from jeff at 2x3 heroes the other day. they were stuffed inside a pwe with even more cards. i sense that the volley of pwe's between us has been renewed. 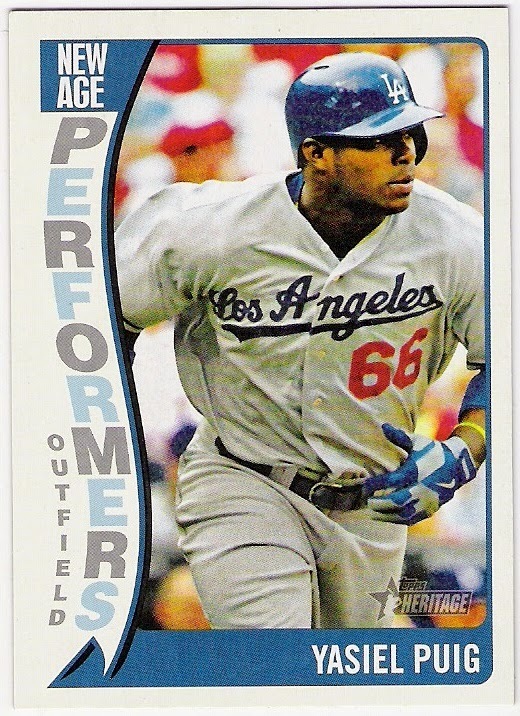 i think puig replaced matt kemp in the new age performer insert set last year. i wonder how long he'll last on the checklist. which reminds me that i should get wallet card out a bit more often. nice cards nonetheless. thanks jeff. 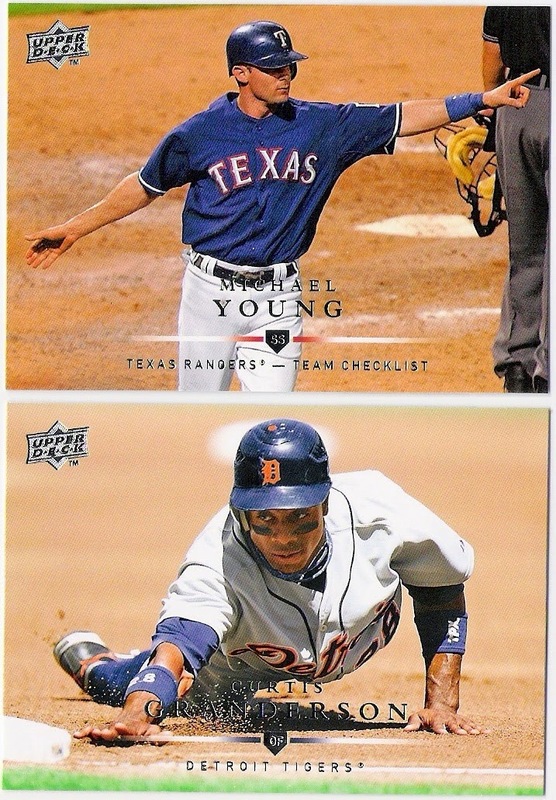 i'll give you some time to digest the package i sent and start peppering you with some pwe's of my own. i've missed out on topher's group breaks over at crackin' wax this year and last, but i know that he'll still have some cards available through his 'take my cards' page. 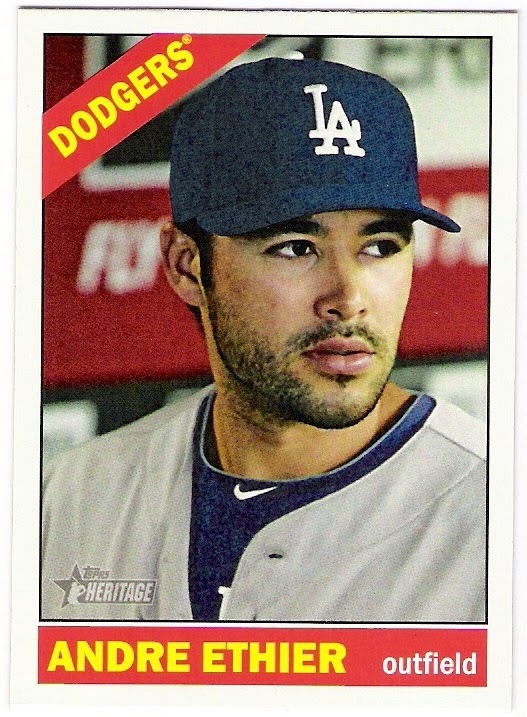 sure enough, he listed some 2015 topps heritage for the taking, and i took. 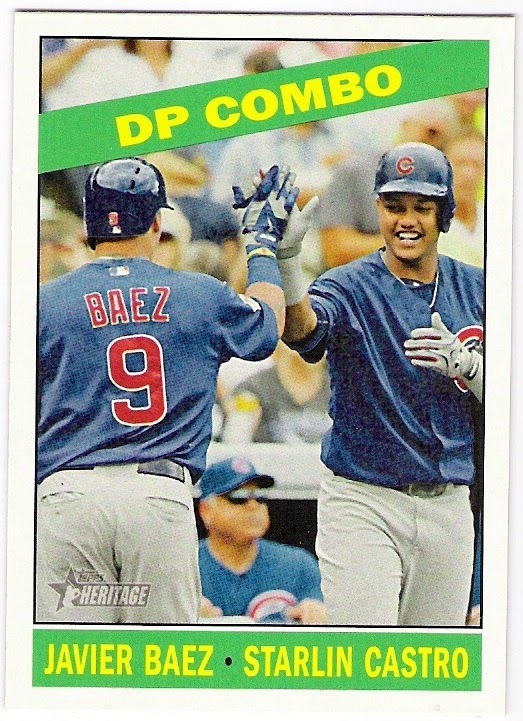 it's not quite true to the original (the back text and photo focus more on offense than defense), but javier baez and starlin castro are a double play combo. 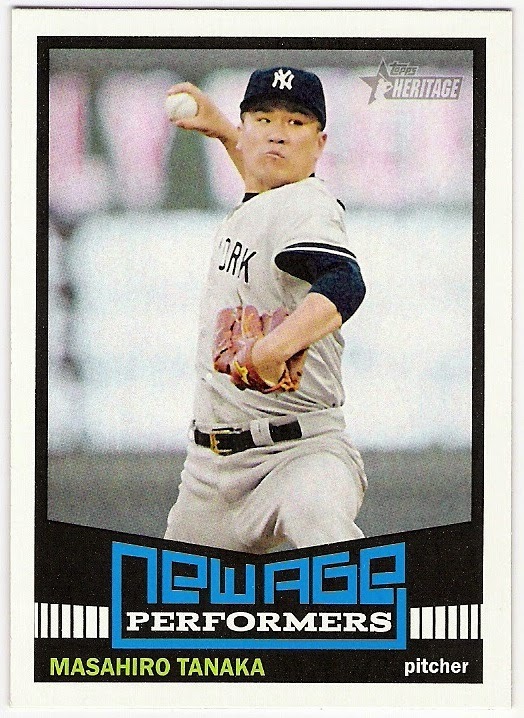 three years ago i looked forward to the bungling of this card, and i'm not disappointed. but it's in his pile right now. thanks as always topher - keep crackin' that wax! 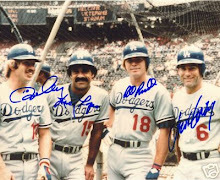 i think the oddly cropped photo featuring the partially obscured dodger catcher would fit nicely in the 1973 topps set as a kreuter card - all that is really missing is the umpire and parts of a couple more players. 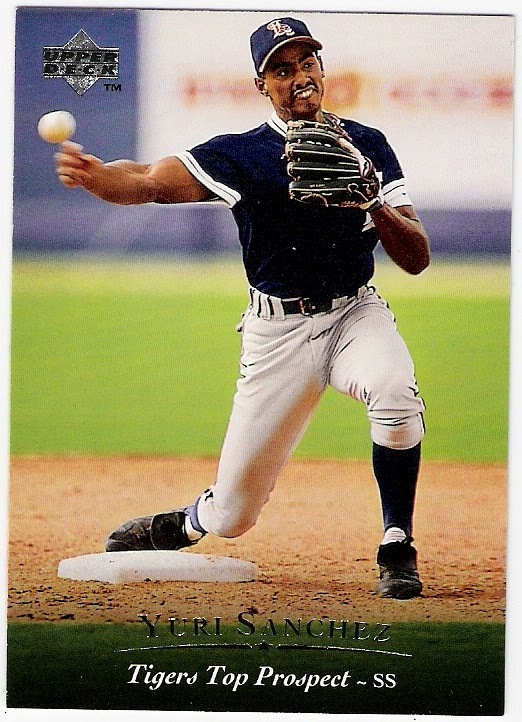 this is another card from 2001 topps stadium club. you know, beneath the clothes you will find the man. and beneath the man, you find his…nucleus. 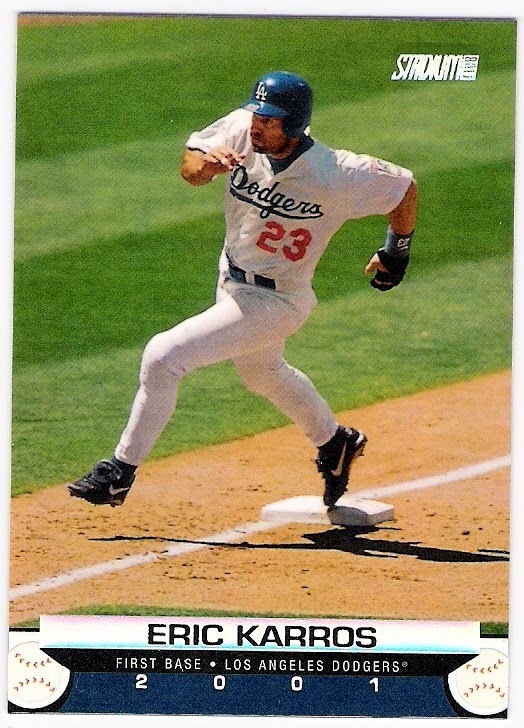 this card features the rookies of the year from 1993-1995 (mike piazza, raul mondesi, and hideo nomo), but the 1992 roy (karros) didn't make the cut. who will hopefully follow jimmy rollins as the dodgers' shortstop after spending this season in the minors at oklahoma city. is a double play turn, because why else would foli be at the bag like that? 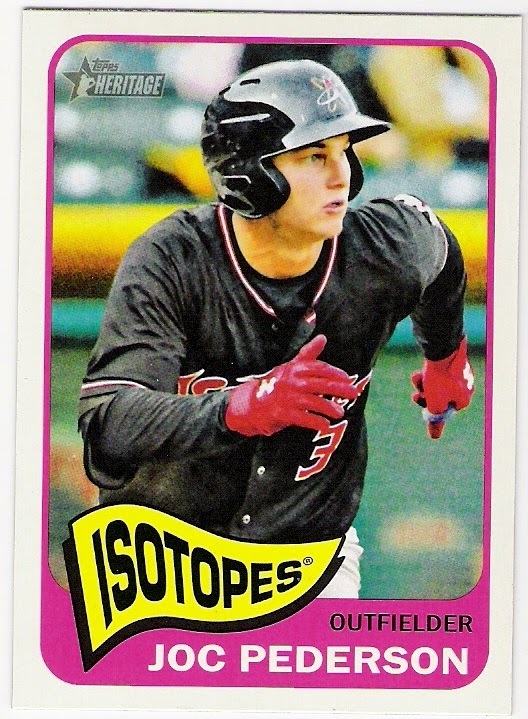 now that i look at foli's card more closely, i notice the parked car in the background behind the spring training fence. 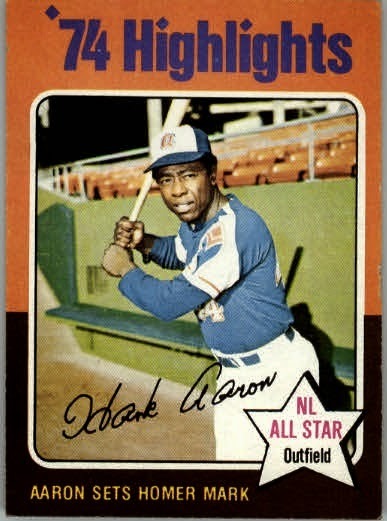 that's another card that could pass for a 1973 topps card. and that is how you bring a post around full circle.